On 5th April, West Papuans commemorated what they refer to as the Day of Hope, the day that the West Papuan Parliament was first launched in 1961. 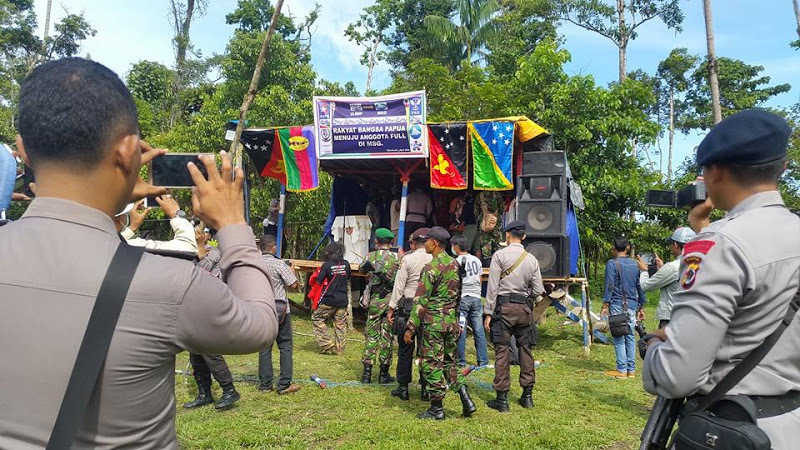 Indonesian military and police storming the peaceful West Papuan prayer gathering because West Papuans were praying for full membership of the Melanesian Spearhead Group (MSG). In the town of Timika, the people of West Papua held a rally in the streets to call for an Independence referendum (Internationally Supervised Vote). They also called for full membership of the Melanesian Spearhead Group (MSG) for the United Liberation Movement for West Papua (ULMWP). After the rally, the people held a prayer gathering in a nearby field and raised the flags of their fellow Melanesian nations. Suddenly the peaceful gathering was stormed by the Indonesian military and police who opened fire and began to beat many and torture many West Papuans on the field. They also tore down the flags of the other Melanesian nations, causing outrage of many Melanesians on social media. Up to 15 West Papuans were arrested by the Indonesian authorities and after international pressure 13 were later released. However two West Papuans, Steven Itlay and Yus Wenda remain in police custody. Yus Wenda is facing a 32 month prison sentence while the rally organiser Steven Itlay is facing life imprisonment for “treason”. Steven was then moved to the notorious Indonesian Police Mobile Brigade (BRIMOB). 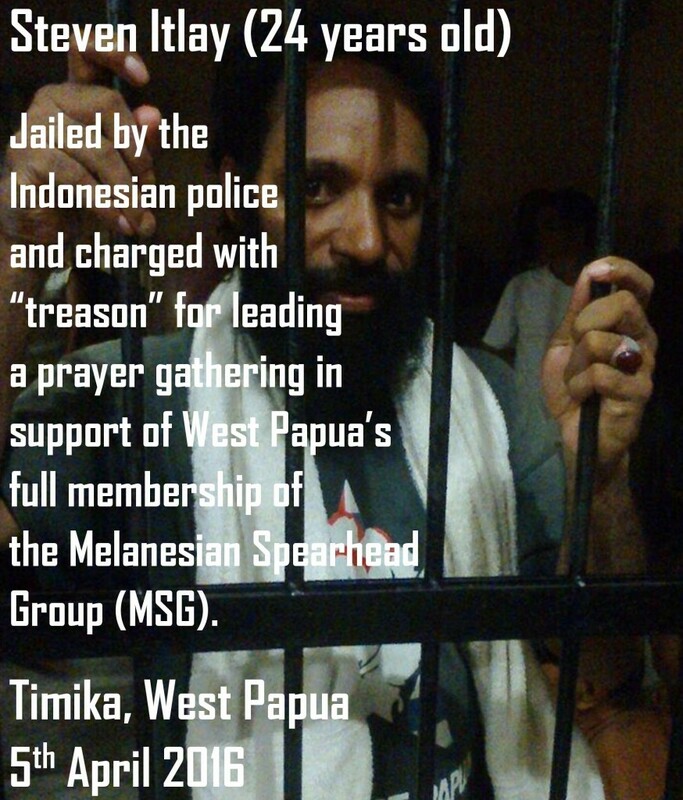 He has now been transferred by the Indonesian authorities to the capital of West Papua, Port Numbay/Jayapura “because the people of Timika are scared.” Evidently the Indonesian police in Timika did not want more pressure following his continued detention without trial. Both Amnesty International and the Asian Human Rights Commission have called for Steven Itlay’s release and urged people around the world to Take Action by pressuring the Indonesian police responsible. It is our ancestral birthright as Melanesian people to be welcomed into the Melanesian family, not as foreigners but as full and true Melanesians. Despite the ongoing genocide and illegal Indoensian occupation of our country, we West Papuans are completely confident that we will one day be full members of the Melanesian Spearhead Group and one day we will be free people at last. 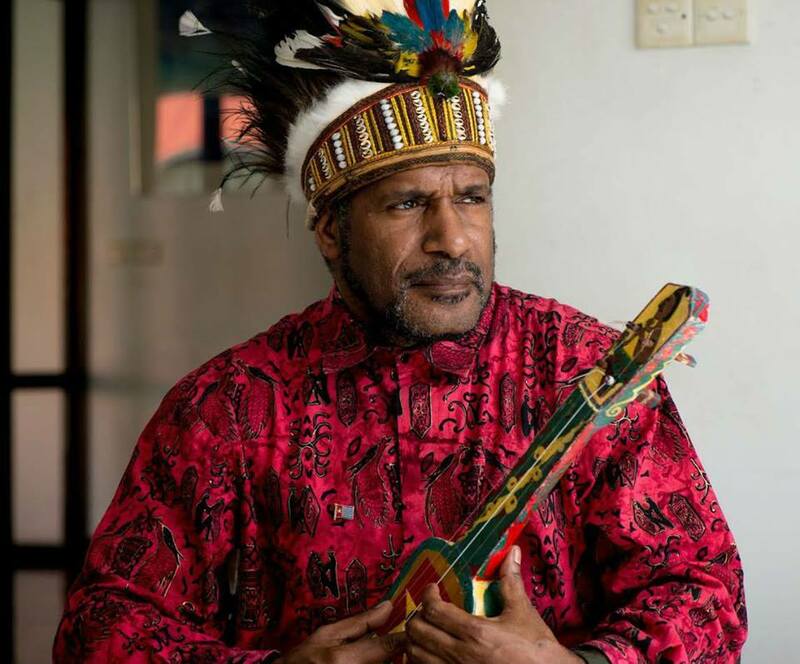 – West Papuan Independence Leader Benny Wenda.